Written by th. Posted on March 22, 2009. Filed under Carbon Fiber. Tagged electronics, gaming, joystick, product. Bookmark the Permalink. Post a Comment. Leave a Trackback URL. Today I soldered the PCB together with a friend. Wired the buttons as well – until I ran out of cable. So the last 7 connections are missing. 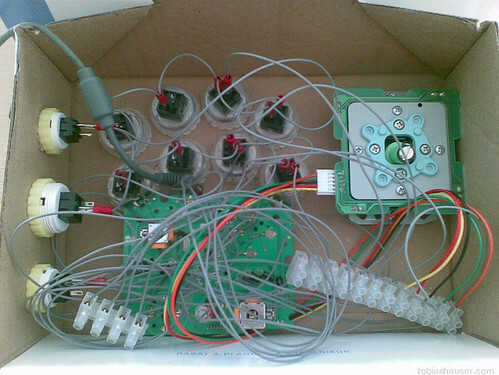 The cables run from the PCB to a terminal strip and from there to the buttons. Quick disconnects are used for the buttons. I tested all cables soldered to the PCB and all connections work – a small wonder considering this was our first time to solder. Tobias Hauser is a freelance project manager, entrepreneurship, innovation and technology management counselor. You can learn more about me on my profile and contact pages or send me an email.